Welcome to the Mount Forest Golf Club your number one choice for a round of golf in the Mount Forest area. We have everything you need to create a memorable day of golf! Our course provides both a challenge for a low handicapper and a great environment for someone just learning the game. We pride ourselves on impeccably maintaining the course and continually making improvements to it! 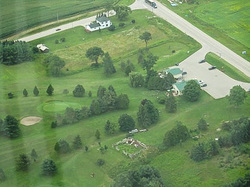 The course is set in the rolling hills just north of Mount Forest and allows a golfer to use every club in their bag. From a 525 yard finishing hole to mid length par 3’s and a couple of reachable par 4’s this course has it all! We have created an atmosphere at the Mount Forest Golf Club that is well suited to a seasoned golfer as well as the weekend warriors. We like to encourage both junior golfers as well as people just learning the game to come out and have a great experience at our golf club. We have a great venue for golf tournaments whether it be a company event or a family get together and you will be sure to enjoy the food and service for your after tournament meal. We look forward to meeting you, and to see you again!! You will be amazed at how our 3 “golf pro’s” in training have grown!